Marrakech -A new historic restoration project is now open right in the heart of the Mouassine district. Marrakech –A new historic restoration project is now open right in the heart of the Mouassine district. 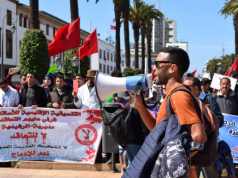 Down the little rue de l’ Hammam, which lies between the famous Mosque and the Mouassine fountain, you will find the offices of Patrick Man’ach, who opened La Maison de la Photographie in 2009 and the Berber Eco museum in Ourika. 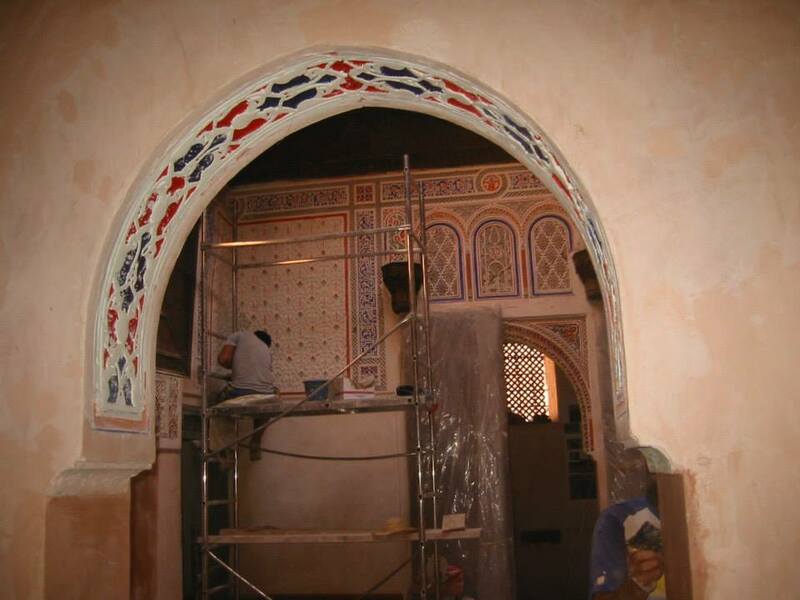 For the last few years, he has been working on restoring a Douiria, or reception apartment, built during the reign of Sultan Moulay ismail (1646 – 1727). After he bought the apartment, Patrick Man’ach felt that its white plastered walls might conceal an older décor. He consulted experts including Xavier Salmon, of the Louvre museum in Paris, and began stripping away layers of white plaster from the apartment walls. What he found was sensational. The apartment had been painted with floral decorations like a medieval courtly garden complete with flowers and colored trellises. The white plaster had actually preserved much of the original decoration. 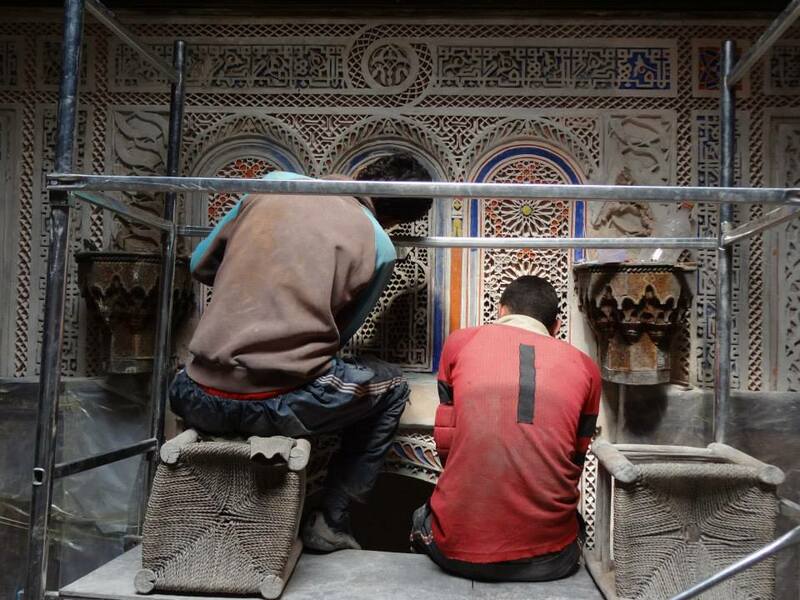 A dedicated team of 10 young craftsmen, skilled Moroccan potters from Ourika worked on restoring the colors of the painting and clearing away the toilets and piping that had been installed by the previous owners. 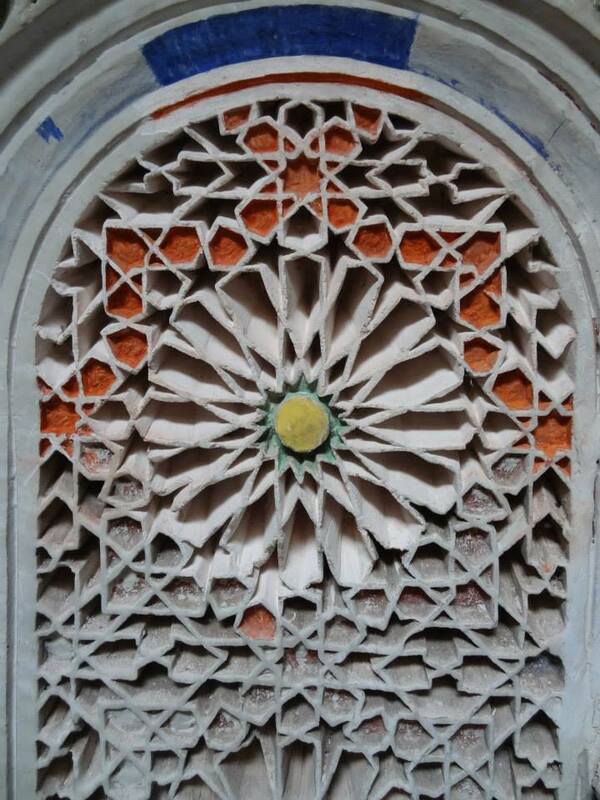 Using gypsum from a quarry in Ourika, the team was able to restore the original pink coloring of the walls. Floors and ceilings had to be renovated as rain was coming in in from the roof. 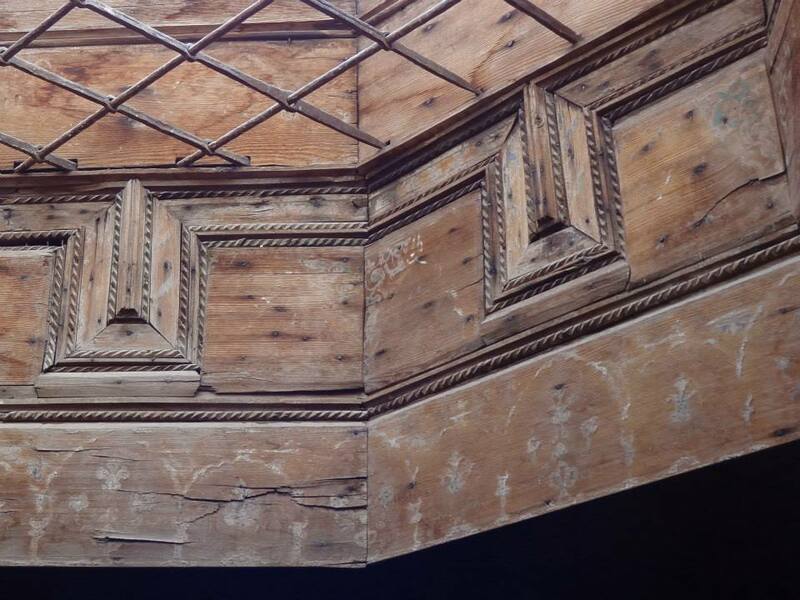 The wooden ceilings of the apartment are from the 17th century and the sun motif is one of the decorations from Sultan Moulay Ismail’s reign. A period-specific motif at the base of a wooden arch in the back room of the apartment also helps date the edifice. The apartment was part of a family home located beside the Mouassine Mosque whose associated hammam provided the name for the modern street. The guest apartment, or douiria, is reached by a short flight of steps to the left of the main entrance. The entrance leads to a hallway with two small rooms either side. These might have been bedrooms, or a dressing rooms and a back room. The two alcoves facing each other in the main hall are crowned with magnificent carved wooden head pieces. The wood in the apartment, including that in the magnificent ceilings, had to be very carefully treated and restored. All the phases of the complex restoration were photographed and are also on display. 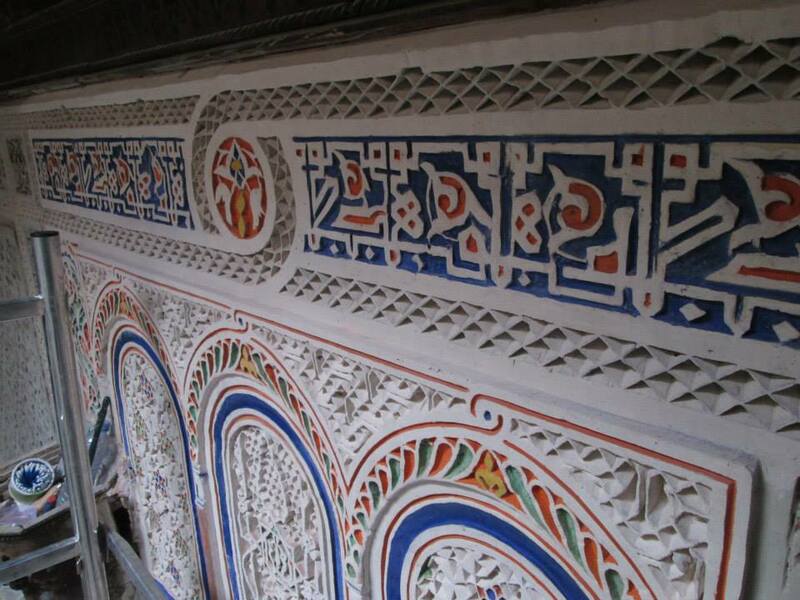 Students of the Ecole d’Architecture de Marrakech visit the Douiria regularly in order to study the restoration process and the historic 17th century decorations. The Douira has been opened to the public and will host exhibitions of high art and special gatherings. 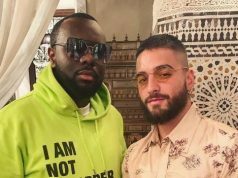 Marrakech has regained another historic heritage venue for cultural occasions, as well as a rare insight into the Arab art of courtly entertainment during the reign of Sultan Moulay Ismail. 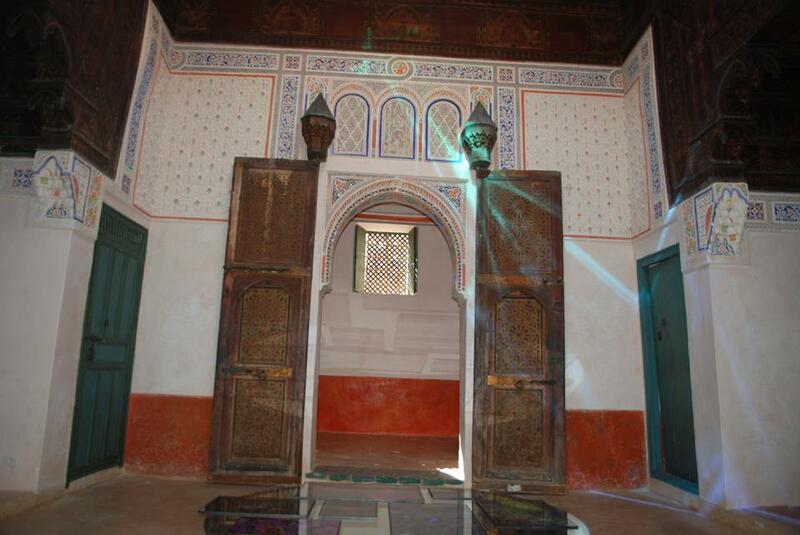 17th century interiors are rare in Marrakech because of the tendency of its numerous conquerors to destroy the architectural work of their predecessors. Perhaps there are other historic interiors hidden under plaster in the medina waiting for restoration . One can only hope they might eventually see the light of day.